Binoculars are optical devices that act as an outdoor gear for you to capture spectacular views and witness distant objects as close to you as possible. Vortex as a brand has been known to provide exceptional optical products and has created a name for itself in the binocular industry. They take pride in providing better optical quality and an improved customer service. 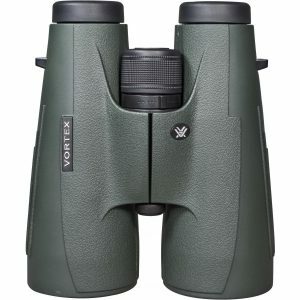 Vortex binoculars have quickly blossomed into one of the best binoculars available in the market today. They have the ability to serve all kinds of purposes and range from super affordable to highly expensive binoculars. Vortex products have been designed to match an array of specifications and are available in several configurations to suit everyone’s needs. Apart from binoculars, they are known to produce exceptional quality monocular, riflescopes, tripods and other high-end optical devices. 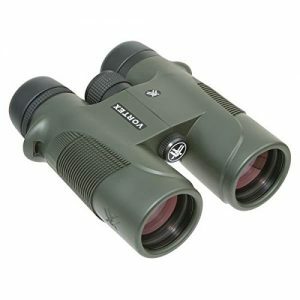 The Vortex binocular range is huge with the main focus on hunting, wildlife viewing, birdwatching, nature observation, etc. These binoculars can also come in handy for sporting and recreational purpose. The biggest selling point for Vortex binoculars is that they have something for everyone. According to the customer’s requirement and budget, there is always a Vortex binocular that fits the exact specifications. Also, these binoculars are capable of providing high quality and high definition images while being compact and sturdy. 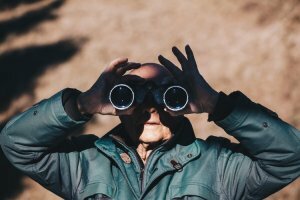 What to look for in a binocular? There are some factors which you need to consider before choosing the best binoculars for your purpose. We recommend figuring this out before reading our Vortex binocular reviews. The clarity and quality of the images are one of the biggest factors that you need to consider before purchasing a pair of binoculars. Vortex binoculars have been known to provide crystal clear views and high definition visuals. If a pair of binoculars can make you feel like you are looking through your own eyes rather than a set of lenses, then such a binocular is a must have. Good quality lenses and prisms reduce the amount of absorption of the light passing through them thereby increasing the brightness of the image. There can be situations where you want to capture stunning visuals in low light conditions. This may not be possible with binoculars that cannot perform well in poor lighting. Make sure to buy binoculars that magnify not only the image but the brightness as well. Also, binoculars that make use of a high-quality lens will be able to allow more light to pass through it and prevent the light from diffracting and spreading due to the irregularities in the lens. This will make the image much brighter. The diameter of the objective lens determines the effectiveness of binoculars in gathering and retaining light. The greater the diameter of the objective lens, the broader will be the field of view and the larger will be the amount of light entering the binoculars and into your eyes. This will increase the brightness of the image since more light is being allowed to enter the binoculars. 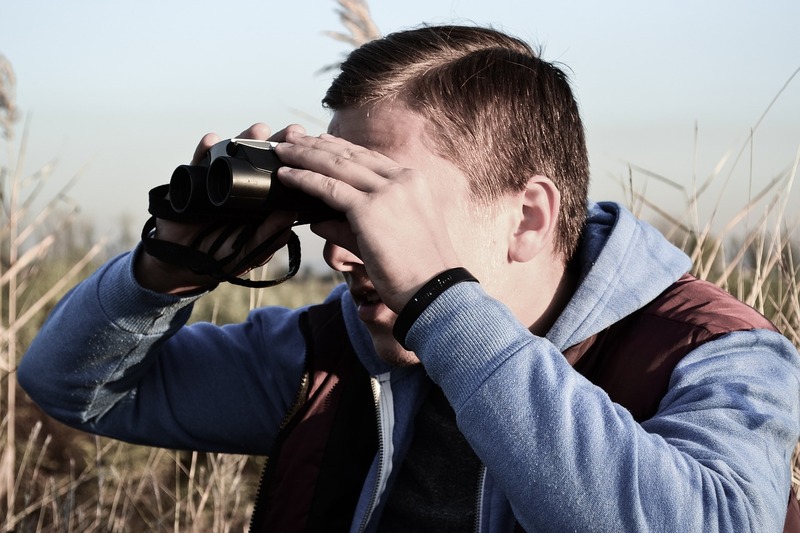 The whole purpose of binoculars is to magnify images at a certain distance and that is why it becomes an essential factor to consider before purchasing a pair of binoculars. Higher magnifying power will allow you to focus on distant objects more clearly. The lens needs to be coated properly to smoothen its surface in order to get rid of its irregularities. This will help prevent the diffraction and spreading of light. Anti-reflective coatings reduce the amount of light being reflected back. Also, lens coatings tend to protect the lenses from scratches and make them easier to clean. The binoculars should be able to provide an all-inclusive optical experience with the right amount of magnification, clarity, brightness, design and eye relief. A product which focuses on just one aspect isn’t what the customers expect. 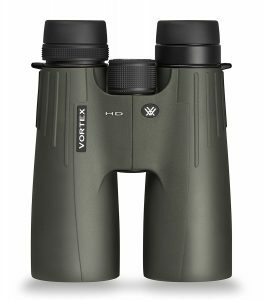 Vortex binoculars are good at providing a spectacular overall optical experience by using high-quality optical components. Here is a list of some of the most popular Vortex binoculars falling into various price ranges. Vortex Razor HD 10×50 Binoculars can be considered as one of the best compact low light binoculars available in the market. They use roof prisms instead of Porro prisms which make them compact, sleek and less bulky. The body is made of a magnesium alloy instead of aluminum to make it lightweight. The magnifying power of 10x makes even the smallest details stand out in front of you. The 50 mm wide objective lens allows ample amount of light through the prism which gives the right level of brightness. The lenses are made of ED glass (extra-low dispersion glass) and are multicoated to prevent color fringing with sharp image edges. Field of view stands at 315 feet/1000 yards. Vortex Viper HD 10×50 Binoculars are a step ahead in terms of high-quality visual results. They stand out by providing super high-quality HD optics with extra-low dispersion glass lenses. The innovative phase corrective lens coating and roof prisms enhance the brightness of the images. The 10x magnification paired with 50 mm objective lens makes for a strong combination of superior quality and sleek design. This pair of binoculars has a solid and rugged external build meant for tough environments that add to the details. 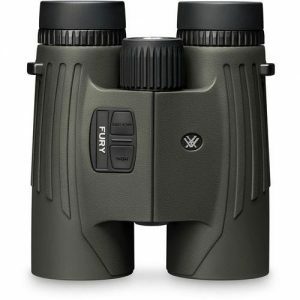 Vortex Diamondback binoculars are known to be the most durable pair of binoculars. They are also one of the most popular ranges of binoculars due to their lower cost and a wide choice of configurations they offer. 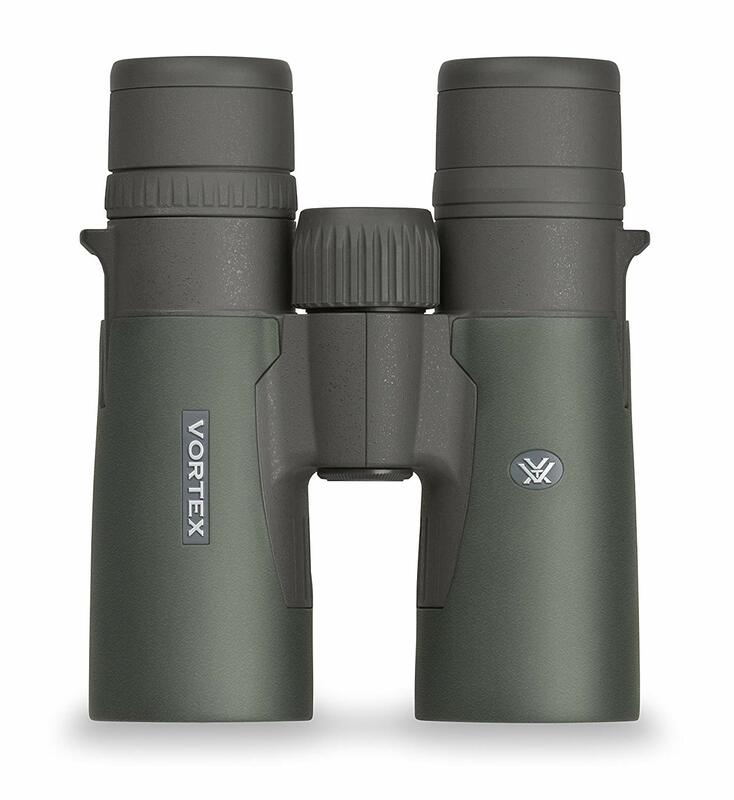 The Vortex Diamondback 10×42 binoculars are fitted with roof prisms, are lightweight and well balanced. They provide noticeably clearer images with greater contrast. The field of view is wider at 345 feet/1000 yards, which is more generous than its counterparts. The phase corrected roof prism and multicoated glass creates stunning images. The external rubber armor coating provides a strong and quality grip. Vortex Fury HD provides a good level of optics and superior image quality designed for comfortable viewing. It provides a combination of high-quality optics along with a powerful laser rangefinder. The maximum range of the laser rangefinder stands at 1600 yards with multiple modes that add to its value. The features that stand out in Vortex Fury HD is the phase corrected and dielectric coated prisms. The tough exterior lens coatings along with a 10×42 configuration make it a strong and powerful pair of binoculars. With a 56 mm objective lens diameter, Vortex Vulture binoculars were made to capture the most amount of light possible. They are an ideal choice for extremely low light conditions where a superior level of brightness is required such as wildlife observation or bird watching at dawn or dusk. The wide objective lens diameter makes the images sharp and bright as ever. On the other hand, the binoculars are a little bit on the heavier side with less compact design due to the large objective lens. The brightness increases with the use of high-grade multicoated glass lenses and phase corrected rooftop prisms. This pair of binoculars stands tall amongst its rivals for providing superior optical quality and brightness at reasonable rates. 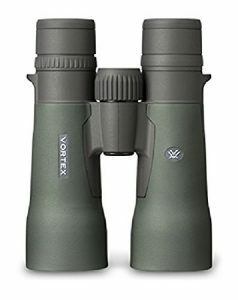 Most of the Vortex binoculars make use of high-end optics and quality components to provide an exceptional experience. The use of fully multicoated lenses with anti-reflective coatings increases the light transmission through the binoculars thereby increasing the image brightness. The phase corrected prisms result in sharp and high contrast images. The only difference among all of them is based on their configuration with respect to magnification and objective lens diameter. This governs the actual power of binoculars in certain surroundings. For example, in low light conditions, some vortex binoculars perform much better than the others. There are several Vortex models that belong to varying price ranges. You need to be aware of your needs and the amount of money you can shell out, before making a decision about which Vortex model to buy. The best pair of Vortex binoculars is the one that suits your specific requirements and fits right into your budget.